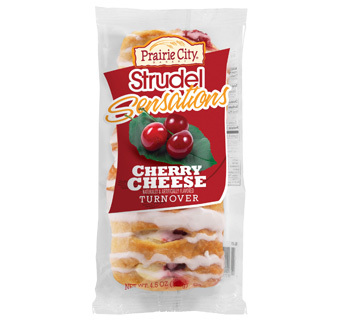 A must-have for the cherry-lover… Our individually wrapped Cherry Cheese Strudel Turnover offer a delicious balance of real cherry filling combined with the great taste of cream cheese. Strudel Sensations are made up of flakey strudel dough with so much premium filling that the other Turnovers out there might get a little green. We named 'em Sensations for a reason... Individually Wrapped Strudel Sensations take Turnovers to a whole new level. Strudel Sensations offer exceptional amounts of premium filling and an oh-so-flakey crust with sweet icing for sensational flavor balance. Available in five delicious flavors including Apple & Maple, Cherry Cheese, Blueberry Cheese, and Strawberry Cheese. They're Stru-delicious!